With the rise in popularity of at home DNA tests for humans like 23andMe, it’s only natural that we would get a little more curious about our pets’ origins. Unless your dog came with official pedigree papers, it used to be impossible to know your dog’s heritage. But now at home DNA testing for dogs has made it easy to find out your dog’s genetic makeup. Whether your dog is a purebred, mixed breed, or 100% mutt, there are numerous at home DNA tests for dogs you can get online, and we have reviewed the best options for you below. Before we had dog DNA tests, the only way to tell your dog’s lineage was if she had AKC Pedigree papers. The American Kennel Club is the largest purebred dog registry in the world. The AKC’s Stud Book records date back to 1875. If you are eligible to apply for an AKC Pedigree, tracing your dog’s lineage can be fun! Your dog may even have champions in her bloodline. However, if your dog is a rescue, mixed breed, or purebred without any papers, the only way to learn her genetic makeup is with a Dog DNA Test Kit . There are many affordable kits on the market, but you get what you pay for. Many users complain that lower cost test kits do not provide accurate results and often seemed to contradict each other. If you are going to spend the money to test your dog’s DNA, go with a kit that has proven results. We have reviewed the best of the best below, you can’t go wrong with either of these options. Embark boasts the most accurate and highest reviewed dog DNA kit on the market today. Their research-grade DNA genotyping platform is backed by the Cornell University College of Veterinary Medicine. Embark compares your dog’s genetic profile to over 250 dog breeds and more than 175 genetic health conditions and traits. They even offer the world’s only canine relative finder on their site, so you can connect with your dog’s relatives if you want to. Their kits are easy to use and their report offers the best overall experience in our opinion. If you’re still questioning, check out their reviews on Amazon, people are raving about this test kit. Wisdom Panel offers two different DNA testing products for dogs and tests your results against over 350 breeds. They provide a customized, online report with the analysis of your dog’s ancestry, weight, physical traits and up to 150+ health conditions (if you choose the Wisdom Panel Health Canine Breed + Disease Detection option). Wisdom Panel is also partnered with GeneSeek, the world’s largest animal genomics testing facility. Most at dog DNA test are fairly straightforward to use. They usually contain easy to follow instructions on how to collect your sample and mail it in. Make sure your dog is properly hydrated and has not eaten for at least 30 minutes. You’ll need to collect a fair amount of saliva during the swabbing phase. Remove the collection tube and swab from the package and gently swab the inside of your dog’s cheek pouch and under the tongue. It will take 30 – 60 seconds of swabbing to collect enough saliva to completely saturate the swab. If you are having trouble getting your dog to cooperate you can try enticing her with a treat to induce salivation, just don’t allow your dog to actually put the treat in her mouth until you are finished collecting the sample. Place the swab into the collection tube according to your kit’s instructions (some may require you break the tube in half), screw the cap on and shake to mix the contents. Pack your sample back into the return box and affix the included label to ship back to the testing facility. Most tests take 2-4 weeks after shipment to return your results. How Accurate Are Dog DNA Tests? As DNA testing has become more mainstream, the results of dog DNA test kits have become surprisingly accurate. However, the results of your test will vary based on the complexity of your dog’s mix and the size of the reference database of the testing company. Embark boasts the most accurate dog DNA test on the market. Embark’s kit has been endorsed by the Westminster Kennel Club Dog Show, Oprah, and is an official research partner of Cornell University College of Veterinary Medicine. By testing over 200,000 genetic markers, they claim to have 100x more genetic information than any other test. Can I Also Test for Health Risks and Genetic Disorders? Some tests also include screening for genetic health disorders. While these tests are not meant to diagnose conditions, they are helpful in planning what you can expect as your dog ages. You should always consult a veterinarian if you suspect your dog may have a health issue. Both Embark and Wisdom Panel offer health panel testing. 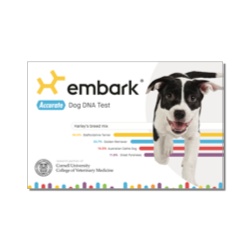 Embark tests for 165+ genetic health conditions including the three most common adult-onset diseases in dogs: glaucoma, degenerative myelopathy, and dilated cardiomyopathy. The Wisdom Panel Canine Breed + Disease Detection kit screens 150+ genetic health conditions. This content uses referral links. Please read my disclosure policy for more info.